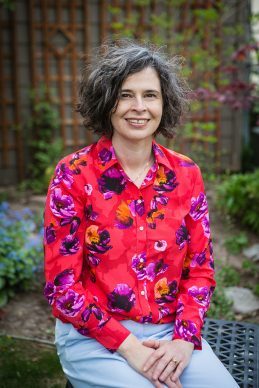 As a professional historian, Kate Holbrook has focused her career on telling women’s stories through the lens of two of her favorite topics: religion and food. 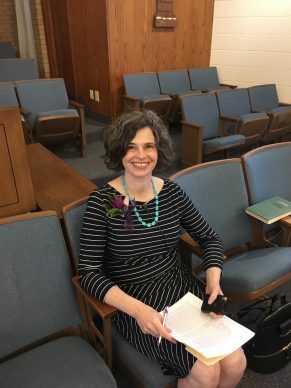 Currently the director of women’s history at the Church History Department, she talks about growing up as an only child raised by her mother and grandmother, how the Church has blessed her life from infancy, the beauty and challenges of managing a home and a career, getting rid of gospel “shoulds,” and how members can constructively approach challenging topics in church history. I was born in Santa Barbara, California and my dad left six weeks to the day after I was born. The landlord decided he was going to move back into the apartment, so my mom had to move two days later with a new baby. Members in her ward just quietly came and helped her. They were packing up boxes and my mom’s aunt was there and my mom started crying. Her aunt said, “Let’s take a break and come back.” When they came back, the ward had finished; the apartment was completely empty. So they went to the new apartment. Her pictures were on the wall and even her toothbrush was right where it had been in the old bathroom. I’ve known the goodness of this church from before I could remember. While we lived in California, my mom taught school and I had different babysitters during the day. My grandpa died on Valentine’s Day just after I turned five, and a few months later my mom called my grandma and asked, “What’d you have for dinner?” My grandma said, “A piece of candy and a Diet Coke.” My mom replied, “Well what would you think about us moving to Utah and living together?” My grandma was thrilled. We moved the summer before I started kindergarten and my grandma took up cooking and eating meals again. What was your experience growing up in Utah like? We lived in Provo, not too far away from BYU. I remember always praying when I was little that I could have a dad, that I could have siblings. But other than that, it was a really good life. My grandma was wonderful. I loved living with the two of them. We had a lot of fun together. They were good at seeing the humor in things, so there was a lot of laughing. I loved to cook and my grandma taught me how to bake. They were avid sports fans and went to BYU basketball and football games or always watched them on TV if they were away games. When I was too young to babysit myself, they would take me to the games and I would sit there and read and the people around us would be kind of mad at me. When I was old enough to stay home alone, I would cook while they were gone to the football games and surprise them. The first time, I think I was about 10, I walked to the grocery store nearby and bought all the ingredients I needed. They came home to a three-course meal. They were shocked. Was there a strong focus on education in your family? I knew there was a feeling that in our family, people go to college, and I needed to study well so I could get a scholarship. College was framed for me as, “You need to get a college degree so that if something goes wrong you can support yourself.” BYU felt like the right place to go, so I did. I studied what I loved, which maybe is a little easier to do if you have the attitude that it’s a backup degree, not a solid career path. I majored in English and loved it, and I was minoring in history until I served a mission in Russia. I decided to minor in Russian, but found out I just needed to do a little more to make it a double major, so I ended up with degrees in English and Russian literature. What was it like serving a mission in Russia during the early ‘90s in the post-Soviet era? It was really exciting. I was there in ‘93 and ’94, and was called to the Moscow mission. When I arrived they said, “We’re actually sending two of you to a new mission. It’s the Samara mission.” They put us on a train to Samara the next day and it felt like a tremendous adventure. I was ecstatic. I’d always been a pretty romantic young person. I had dreams of high adventure and rescuing children from burning schoolhouses, being martyred for a noble cause. So riding this train across Russia—I think a 14-hour train ride—was really thrilling. My first companion was American and she met me at the train station. President Nelson, then Elder Nelson, was picking his son up from the mission, so I hadn’t been there very long when we had a conference and got to hear him speak. That gave me the wrong impression that all these exciting things would always be happening. Because after that it was always just work. From the time I had been there six months until the end of my mission, I was with Russian and Ukrainian companions, and that was fantastic. They were new to the Church because the Church was new in general there. I had a 42-year-old companion who hadn’t been to the temple or to the MTC. 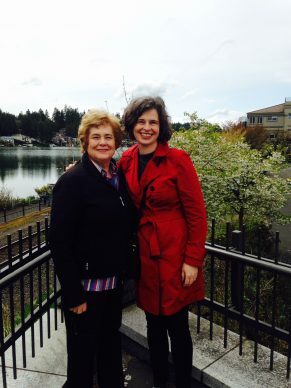 She was learning what the Church was at the same time that she and I were companions, and I was half her age figuring out how to teach other people. What were people’s attitudes toward religion in general, and Mormon missionaries in specific? There was no real anti-Mormonism for a lot of people. There were two contexts in which they’d heard “Mormon.” One was a small church that had been started a long time before, and the other was in Sherlock Holmes’ A Study in Scarlet. A lot of them had read that book; they’re a very literate people. Much bigger readers than we are in this country. I don’t know what’s happening now, but back then people would memorize poems and passages from famous books and they really knew the Russian writers. They took the humanities more seriously there than we did at that time in this country. People were very interested that we were Americans and a little interested in religion. But it felt so foreign to them that it wasn’t something they could generally take in easily. Those people who had been religious had people in their families, often a grandmother, who secretly taught them religious sentiments. So if we came out saying something like, “This is the one true church,” then it was over. They had sacrificed and risked in private, nourished this flame of belief in God, so to have us make some statement about our church being better didn’t go over well. How did you decide you would go to Harvard and what you would study? I was going to a Ph.D program in Madison, Wisconsin in Russian literature, and a friend who was also looking at Ph.D programs said, “What made a big difference in helping me make my decision was to actually visit the places.” So I thought maybe I should go there. I went and it just felt so wrong. There was no question this was not the right choice. It was a bummer because I had applied and been accepted and this was a great program that I had been excited about. I got home from that trip and I thought, “Well, I spent one rainy afternoon in Boston and fell head over heels for it. I’m just going to move there and figure out from there what I want to do with my life.” So I did. I graduated from BYU in August, and a week or two later got on the plane and moved to Boston. I went to a temp agency and got some work, which gave me the chance to try out a few different things. But really what I had in mind was working at a university so I could take some classes and figure out what I did want to do the next degree in. I ended up getting a full-time job at Boston University in their Core Curriculum program, which is a great books program, and it was like finishing school for me. The faculty members I worked with were fantastic. I got to see how people in the academy outside of BYU think and how they socialize and what they talk about. It was a really great job. I promised them I would stay for two years, and it was two years to the day. During that period of exploration I figured out I wanted to go to divinity school and the semester started right when my two year promise was up. At what point did you meet your husband? I met Sam at a party just two days after moving to Boston. He heard me say that I spoke Russian then at church on Sunday he introduced himself. I had been watching him all through church and listening to the comments he made and was really intrigued by him. He had decided he wasn’t going to date for a while, so we hung out for a couple of months. We dated for about a year and a half and then got married. I started divinity school just a few months after I got married. Kate and her husband Samuel Brown. Photo by Samantha Kelly. You’ve studied religion, gender, and food. How did those things become the focus of your research? At Harvard Divinity School you can take courses all over the university, so I explored. I had a professor that I really liked in the divinity school who taught on religion and society, who invited me to teach with him. I loved teaching so much that I realized I actually did want to get a Ph.D. I had been a little hesitant about that because I had heard such horror stories about what it could be like. I was also trying to have a child at the time, and it wasn’t working out; I kept having miscarriages. It was when I was accepted into the program at Boston University in Religion and Literature that I also had a viable pregnancy. They held my spot for me for a year, so my daughter was 11 months old when I finally started. I also kept teaching the religion class with the professor at Harvard when she was young. I would take her to lectures with me and she was really good, so we would just bring her in the stroller. If I had to participate in a lecture, one of the other teaching fellows would watch over her. As I was deciding on a dissertation topic, I thought, “What are the things I’ve felt really intrigued and passionate about my whole life?” I eventually figured out that I would do a dissertation about religion and food, so automatically women’s stories would be prominent in that topic. Really it was about the everyday experience of lived religion. One chapter is just on favorite recipes, why they were embraced by the community. I read them closely, almost like you would a poem. What do we learn from the way this recipe is described? I finished my coursework when we decided to move to Utah. What influenced your decision to move? The East Coast lifestyle can take a toll on family life, minds, and well-being. Even though it’s such a stimulating, wonderful place to be, we wanted our family to have a little bit of a different experience. Since we were from the West, there was part of us that was deeply Western and we valued what that had brought to our lives and wanted our children to have a similar opportunity. Especially just living around mountains and having experiences in mountains during their formative years. Of course there are mountains in the East, but we were thinking about the Wasatch and Uintah mountains. I feel like Russia is a home to me, and I certainly feel like Boston is a home to me, so it wasn’t not a rejection of those places. But there was something about Western U.S. culture that I missed that feels like home to me. I hoped we would feel as comfortable at church in Utah as we did in our Cambridge ward. Then we moved here and I thought, “Wow, was I snob.” I felt bad that I had those apprehensions about culture and homogeneity as I settled in. We’ve lived in two different houses here in two different wards, and just loved, loved them both. We’ve been lucky to be able to have those be our church experiences here, although I don’t want to say they’re rare. We’ve been accepted for who we are. I feel like people embrace what we have to give and forgive whatever makes us weird outliers. The Church has been a really beautiful experience for both of us here. Kate in Millcreek Canyon, Utah. How did you end up at the Church History Department? I would work half days with my little kids. I passed my oral exams, and then wrote my dissertation prospectus. While I was writing the prospectus I read a great book that all graduate students should read called How to Write Your Dissertation In 15 Minutes Per Day. It’s a lame title, but a really useful book. The author talks about the importance of having a writing group for deadlines, support, and feedback. 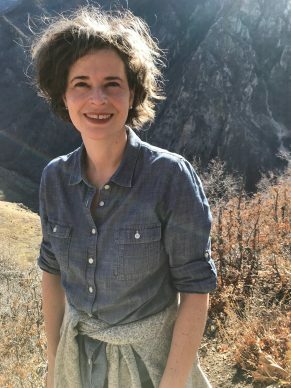 I put together a writing group, and Jill Mulvay Derr (a historian in the Church History Department) was in my writing group. One day she said, “I am going to retire and they are going to replace me with somebody in a position that’s specifically to study women’s history.” When she said that I thought, “There’s my next step.” I hadn’t finished my dissertation yet, but it felt so right that I applied anyway. What was happening with women’s history up until you arrived? Jill and other female historians had done a lot over the years here with (former Church Historian) Leonard Arrington, whom they loved, who was a great supporter of women’s history. When I came on, Jill was working to finish a book that she and Carol Madsen had first thought of in the year 2000—a documentary history of the first fifty years of Relief Society using documents that told that story in a vibrant way. That was the project that I inherited and got to work on as my first project here and it was published in 2016. What is the primary source material that you work from? The Church archives are tremendous. They have a lot of global history too, and they’re getting more all the time. The global history is just taking off here in really exciting ways. Jill and Carol had already chosen—from their decades of studying Latter-day Saint women—most of the documents that would be in that book. We used other things like Relief Society minute books and other primary sources to help annotate those documents and write introductions to each one to help readers put them in context and understand their significance. Jill and I overlapped for my first few months, which was great. During that time, we had a conversation in which one of us said we really need a women’s journal of discourses. From that conversation, I walked away thinking, “That’s the next project.” When we finished The First Fifty Years of Relief Society, I had already received all the approvals for us to get going on At the Pulpit. It was just the right book for the right time and everybody saw that. I think there was already a good awareness that the history needed to be more inclusive of women’s experience. In some ways, five years earlier it would have been great to have At the Pulpit out, but something about the timing made it so that really everybody was ready for it. This isn’t a book that only the feminists were cheering, or only the conservative people were cheering. This book crosses all those lines; it speaks to everybody. I think that’s why it’s part of our Gospel Library app, and now it’s available in Spanish and Portuguese. Kate preparing to speak in Hillsboro Oregon. Photo by Karen Baxter. What drives you to do history on Mormon women? There’s so much more to understand about Latter-day Saint women, and so much more to understand about the history of the Church by bringing women’s experiences into it in a more vibrant way. I feel like there’s a lot still to do in that area. Especially looking a little more at race, and looking more globally. Sometimes those categories overlap, and sometimes they don’t. I try to be cognizant that there’s a lot to do in the U.S. history of the Church that’s more attentive to race, and also really cognizant that I’m a white person. I try to figure out how to best tell those stories from a fair and useful perspective. That will require me to consult with a lot of people who don’t look like I do and ask for their help. 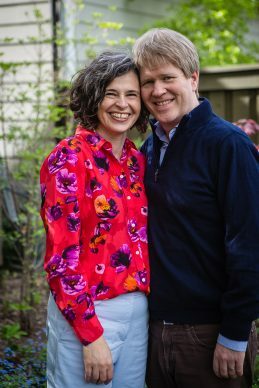 How do you feel like your work can help Mormon women see themselves more fully as individuals and also as an integral part of the larger church organization? One of the things that surprised me with The First Fifty Years of Relief Society, which is a heavy book and a little bit on the academic side, is women in their 60s and 70s who aren’t scholars, who don’t tend to read history books, would stay up late into the night reading. This book shows that women have been there, shaping the Church from the beginning. For some women, it has been really important to see that. Sometimes for a younger woman it’s less of a surprise. They’ve come of age in a different time. They’ve gone to college at a different time. For the younger women, it’s still really important that we study the words and insights of women and understand specific contributions they have made. I don’t know why history matters so much. But I can really feel how much it matters when I learn about these women’s lives—learning the details of a life, learning how she felt. One woman featured in At the Pulpit had seven daughters. She would edit the Young Woman’s Journal with one hand and hold a baby with the other, or hold a meeting and at the same time darn socks for her daughters. It’s so meaningful to read the way women with their responsibilities have looked historically—how they have contributed broadly without neglecting at all what was going on in their own families. Maybe it’s those details that make them really relatable to us as readers. 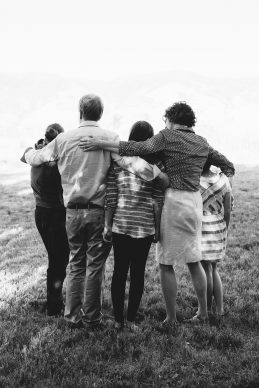 How has your research and your work influenced how you have raised your daughters and taught them what it means to be a woman, or more specifically a Mormon woman? My daughters treat me so well, and part of that is when I have a Church history story to tell, they don’t roll their eyes. They sit up and listen and ask questions. I’ve loved to know these stories, to be able to share them with them. To put forth these examples of really savvy, independent, faithful, women—to show my daughters that they’re part of this religious context—that means so much to me. I love this church. I love what happens in a congregation. I love how it takes care of the needs of other people. I love how it makes me grow by trying to be aware of other people’s needs and help meet their needs. What it feels like to be part of a community where you’re known, where you go every Sunday, where people are looking out for you, they’re helping you raise your children, and you’re helping with theirs. That collaboration means the world to me. And it’s not just the community. It’s the community with Jesus. I don’t think that this community works without Heavenly Father and Jesus, and modern revelation, and scripture. I love visiting teaching and home teaching, and now ministering. Kate with her husband and children. Photo by Samantha Kelly. On your website it says you write, study, and interpret history full time. How should people interpret challenging issues in church history that they may have not known about, or that trouble them? It’s different of course for somebody who has a Ph.D or is trained to interpret history, and somebody who’s an everyday member of the church who has different skills than that. Interpreting history is what I’m devoting my professional life to. For me, that means reading primary documents, reading secondary documents, reading historical context and trying to put that all together to try to tell the most accurate narrative that I can. But other people can come across facts that they think they should have known that they didn’t know. For some people that doesn’t bother them too much, but others really have a lot of pain and dissonance over that. I think when things are framed as the Church hiding something, that doesn’t sit quite right with me. I don’t think that’s true. The last official history of the Church had plural marriage in it; it was all in there. If somebody was interested, things weren’t hidden. But I recognize at the same time that they could be going to Church every Sunday, and they could have gone to seminary and never learned that Joseph Smith had plural wives, or whatever it is that’s distressing. Some things haven’t been emphasized, or else there wouldn’t be people who are faithful, attending members, who are surprised by something later on. I recognize that that’s really hard for people and I don’t want to be dismissive at all of the pain that they experience around it. For me, the Church is this really beautiful thing, and you can sit with the discomfort until it starts to make sense to you, or you can give up all of this beauty. I agree with Leonard Arrington that there’s nothing to be afraid of in our church history. They were humans. To study them deeply from reliable sources can be a real source of spiritual empowerment and strength. To have a partial knowledge of a few things and to not do all of the work of really going back and looking at it in context, that can lead you astray. If you’re not bothered by it, and you’re not interested in history, then God bless you. Keep doing your ministering, keep doing good work. But if you’re bothered by it enough to leave, or to allow it to create a real rift between you and a sense of the spirit in your everyday life, then I think it’s incumbent on you to do some digging, and to be really smart about the sources that you’re using to help form your opinions. If you’re only reading things from sources that are meant to tear down, then you’re going to end up in a torn down place. Kate Holbrook. Photo by Saydi Shumway. How has your work and study of history influenced your faith? I have a real sense that God’s hand is in this work, that it matters a lot. I feel a lot of spiritual direction in the everyday work that I do, from choosing what I should write this chapter about or what the next book project should be, to knowing how I should write this paragraph in a way that is true to the people it concerns and to the time it concerns. I’ve had sources fall into my lap. It’s a lot of hard work. I don’t mean it’s all given to us. But there are also a lot of tender mercies that come our way. I am also really aware of all of the work that was done for decades before I got this job as a specialist in women’s history. I feel very lucky because the timing for my position was right that I, with my particular aptitudes, could step in and be ready at this time when there was a real receptivity church-wide to publishing and hearing more about women’s history. That all came together in a way that was lucky for me and has felt really glorious to participate in. Do you feel like women’s experiences in the Church are different globally than in the Intermountain West? There’s a huge difference globally. It’s one of the things I’ve seen from watching the general authorities, and I include our women leaders in the term “general authorities.” They’ve been aware of it for decades, and are still really aware. I think sometimes our concerns or priorities on the Wasatch Front, or in the Cambridge Ward, are more about the particular kind of Latter-day Saint that looks like us. I saw on my mission how women in Russia ostensibly were more equal in some ways in the workplace, but they were still doing all of the second shift work themselves. It was culturally acceptable to have a mistress. So in some countries, to have a husband join the church and commit only to be with them, and to be with them forever, and to really take a direct role in helping raise children, that means a lot. I care a lot about human welfare. There are a lot of cultural traditions that get meshed together when somebody joins the Church, and it’s important to take those into consideration and not have an attitude of social superiority, or think that we know what’s right for women in general. Because sometimes in another context, in that particular time and scenario, we might be wrong. In the Women and Mormonism book, a woman who grew up in Sierra Leone said in her country there’s a saying that the woman can’t walk next to a man on the street. Because woman was taken from Adam’s ribs, she belonged behind and down. So to join the Church of Jesus Christ of Latter-day Saints where she feels that a woman walks next to a man, that’s a huge shift. One she feels really grateful for. 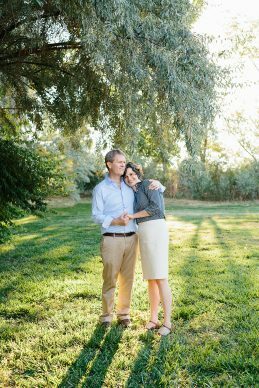 How have you and your husband balanced two very busy, research-driven careers at the same time? There are concrete strategies, and each person finds her own strategy about how to make things work. We do have the funds with us both working to have somebody clean our house once a week, and that’s crucial to making things function in part because I care a lot about order and cleanliness for my psyche. For me to not break down, I need some semblance of order. We also try to get all the laundry done in one day because then there’s a beginning and an end to the task and you have a six-day break from laundry. Sometimes this works and sometimes it doesn’t. I read a book twenty years ago about male-female tasks and how female tasks tend to be the kind that are never ending. There are always more dirty clothes, always more dirty dishes, things that pile up. I’ve tried with the domestic housekeeping part of our lives to have there be beginnings and endings to tasks as much as possible. As our kids got older, we were paying a babysitter, but it was getting easier to babysit them. We started including helping with laundry as part of what it meant to be paid to babysit our children. I think it does tend to be hard to hire help for those of us raised to be self-sufficient. Kate and her husband Samuel Brown. Photo by Saydi Shumway. One of my favorite things we do is I cook on Monday nights for us and one other family, my husband cooks the next night, and the next night we have leftovers. Then on Thursday, the other family cooks for us and we get leftovers from it. It’s not overwhelming because we’re not cooking for six families, it’s just one exchange a week. I go home from work early on the day I cook so I can make a really good meal, then stay later on the other days. If nothing else, if your kids don’t like what you’re cooking, at least your friend might. You just want to find somebody who has a similar approach to you, whatever the approach is. You have battled ocular cancer. How has your experience with cancer influenced your relationship with God? It invites you to be in a place where you really say, “Thy will be done.” There’s only so much you can do. You can get treated, you can try to find a doctor who is knowledgeable about whatever your issue is, you can show up, you can do the things you’re supposed to do, you can suffer through the treatments. But there’s a lot that you have no control over. For me, it makes the things in my life that are beautiful more poignantly beautiful, and it gives perspective. I don’t know how long the good things that I enjoy are going to be around. I’m really grateful for the good things, like going for a picnic with my family, and I’m going to try to make space in my life for the good things instead of putting them off. A couple of years ago, we finally got so that we were regularly doing family scripture study. It’s turned into this really sweet experience. If somebody’s in a snit and doesn’t want to join, we just do it without them. But for the people who want to come, often we just read a few verses and say a prayer and we’re done. Other times people will come hang around and teenagers will start to open up and say a little about their day. We end up having this little extra time together that feels like a gift. So much of your professional and mental energy is taken up with church stuff. How do you approach scriptures as personal devotion? I had a dentist 20 years ago who was trying to get me to floss and he said, “If right now you’re flossing once every two months, then see if you could bring it to once every two weeks.” I thought that was a really good way to think about church stuff too. That flossing conversation made it so I started reading scriptures on my own daily. I worked into it gently once a week, and then a little more, and a little more. I think it’s really good to get rid of “shoulds” or some ideal sense of “this is what scripture study looks like.” Follow your bliss in scripture study. They are a gift to us. If you’re wondering, “I always hear about Ammon, and I kind of forget who he is except for this one thing,” then maybe you want to spend a week reading the Topical Guide entries about Ammon. Or if there’s a story that strikes you, maybe it’s a parable in the New Testament that’s hard for you to get your head around, that’s a good sign. I think discomfort means there’s something that’s not obvious to me here. There might be a big payoff if I spend some time with it. Spend the time—prayer time, staring into space time, reading time. I don’t mean you need to study scriptures for half an hour a day if that doesn’t fit into your life. Just five minutes a day. Let yourself be free to treat these as a gift instead of as a duty. Maybe there are ways that applies to your relationship with church history, too. The people who study the men’s version of church history, there are facts that they will have at their fingertips that I do not have. I’ve thought, “Well a lot of people know those things really well. I’m going to focus my energy on the things that people don’t know, and things that might still be buried in this library where I work.” I don’t feel guilty about that. I feel I’m focusing on this thing that I was put on the earth to learn and to give. I think for an everyday person, who is not a historian, you can approach church history that way too. “I want to learn more about this woman.” “I wonder what it was like at this time.” Just read up on that. I love it when I have a teaching calling; it gives my study direction. Right now I’m a gospel doctrine teacher in my ward along with my husband. I teach every other week and always have in my mind, “What’s the next lesson?” I do this even on weeks when I’m not teaching, I’ll read the scriptures we’re going to be talking about over and over and really try to let them sink in. I like to read The Jewish Study Bible from Oxford. It’s really helpful from the perspective of a church member wanting to study her scriptures because the commentary is reliable and the translation is more clear than the King James translation. This translation helps me to love what I read in the Hebrew Bible. I do want to give a plug here for Saints, the new church history. The day it was released in English, it was released in 14 different languages. The way they have incorporated women’s experiences and contributions works well. I love that it’s written in an accessible way. I love fiction and Saints feels more like entering a world where physical sensations are described and there’s dialogue. The thing that’s great, and it was super labor intensive, is that all of it is accurate. If it says it was an “extra hot summer,” they’ve done that research. And all those things we were talking about, the facts people thought that should have known but didn’t, they’re in this book. Plural marriage is in the book, the seer stone, the Urim and Thummim. Saints is really a resource book, not just a history book to put on your shelf. This can be your way to engage with church history.